When Matthew and Caroline Barnetts' story first broke into Christian consciousness across the globe, it inspired many pastors and leaders to finally acknowledge the part of themselves they had been often taught to ignore. It was unusual to hear of a large, popular, American, Pentecostal church that centralised radical engagement with the poor. Most church experts would teach us that you can't build a church with 'people like that' but maybe, when your church was big enough and had a great building and shiny brochures then, perhaps, it could have such a ministry, in a small corner some where. In his first book, The Church that Never Sleeps, a young Barnett turned that idea on its head and breathed life into many pastors and churches that had always struggled to justify their seeming indifference to the disadvantaged. For a while he was the flavour of the month, speaking at pastors conferences around the world and even now, many years later, there is increased intentionality for community engagement in many Pentecostal and Evangelical churches - thanks in part to his and his wife's example. My wife, son and I visited the Dream Centre LA in 2006 inspired by his first book and its message and the experience changed us, our church and community. 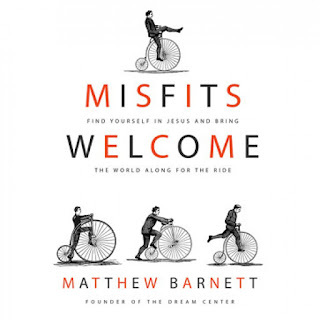 Now eight years later, reading Barnett's new book, Misfits Welcome: Find yourself in Jesus and bring the world along for the ride, is like a reviving balm as much because it shows the call to engage the poor is alive an well, much more than a fad, and still deeply inconvenient in a life-giving way. It's a simple book, filled with the stories of the Barnetts' journey that continues in many ways to be counter-cultural, as the Gospel has always been. He shares many of his insecurities, doubts and perceived failings almost as an encouragement, as if to say, 'I'm nothing special and see what God has done'. It's not easy to swim against the overwhelming tide of comfortable, consumer Christianity and there are little hints of this challenge in the book. But true to his philosophy of hope and of not seeing yourself as a martyr just because you serve on the streets, these glimpses are swallowed up by stories of risky, spontaneous compassion and strong encouragement to do the same. It is true that many issues such as drug use, sexual abuse, violence, crime, mental illness, and poverty can seem intractable problems in people's lives who often live in constant chaos, shame and disturbance. But Barnett champions the cause of believing anyone can find wholeness and live out their dream. The challenge for churches is to be both spontaneous and serious in responding to these needs and not precious about seeming 'nice'. Speak to people's potential, not just their need is one gem from the book that could revolutionise our care for thoes in need. His line that his church is full of pimps, prostitutes and prisoners, and that's just the staff, is born out by the telling of many of their stories. In Misfits Welcome we also see something of the social action faith of Caroline Barnett who was a volunteer at the Dream Centre before the couple got together and were married, witnessed by a crowd of LA's homeless and celebrities. Misfits Welcome presents a welcome face for Western Christianity and may energise those who find their faith jaded and listless. And for all of us that secretly feel like misfits, it is encouragement that we are valued and can make a difference, even with our brokenness and crazy ideas. We hope you enjoyed Cread's book review of Misfits Welcome. Please share with others and leave a comment.